Control Lines — O'Day Mariner #1922 "Orion"
Sailing solo can present some challenges. Maintaining control and adjusting two sails in all kinds of conditions on the water can be the most challenging of all when it’s just one person. “Stock” Mariners have the halyards cleated at the base of the mast, and when you’re sailing solo in rough weather, it can be a bit unnerving to leave the tiller and climb up on the companionway to raise or lower the sails. Of all the improvements I have made to my boat, the two that have helped the most to simplify sailing solo are having a furling jib and leading the control lines led to the cockpit. 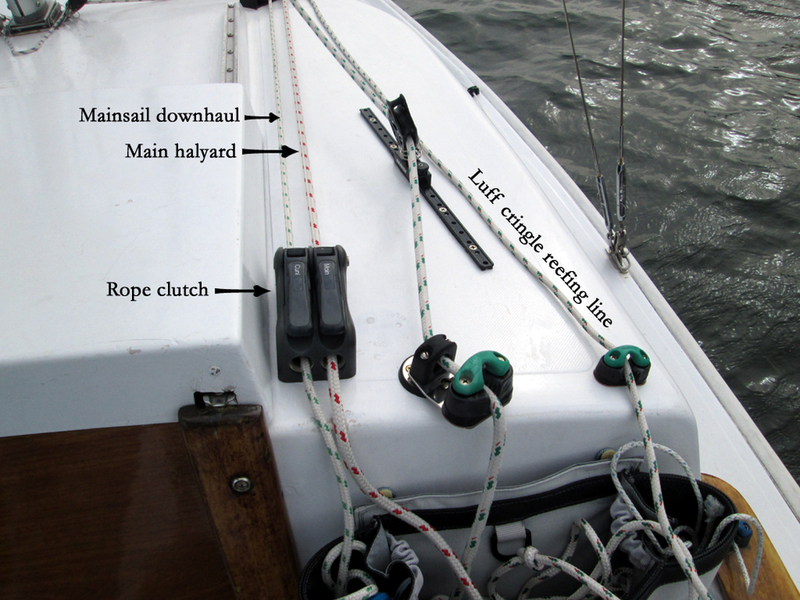 I use the Harken Small-Boat Furling system which consists of a furling drum and a top swivel. The bottom leading edge of the jib (the “tack”) connects to the drum, while the top of the jib (the “head”) connects to the swivel. Unlike other furlers like the popular CDI furler, the Harken system requires that the jib have an internal wire sewn into the luff with loops that poke out at both ends. The tack and head are then seized to the loops with thread so when the wire rotates, the whole leading edge of the sail will rotate and thus roll up. This internal wire actually serves as the headstay, so it will replace whatever existing headstay you have. Furthermore, there’s a small length of wire (a “pigtail”) that is needed to make up the difference from the top of the swivel to the mast itself – mine is approximately two feet long. One end has an aircraft style fork to attach to the mast tang with a clevis pin and the other end connects to the swivel with a swage eye and another clevis pin. The entire length should equal, obviously, exactly the length of the existing headstay to be replaced. Finally, I used 3/16” line in the furling drum, and I have it run through small fairleads on the deck up to a camcleat on the coaming top. The downside of this system is that it is not possible to “reef” the jib, meaning, you can’t roll it up halfway to reduce sail. Either it’s all the way out or all the way in. However, if I’m sailing in conditions where I’m even thinking about reducing the jib sail area, rolling the whole thing up isn’t a problem. Let’s take a look at each one starting from left to right. Mainsail Reefing Line – Leech Cringle. I use a double-line jiffy-reefing, or “slab-reefing” system to reef my mainsail instead of a single-line. (See more about jiffy-reefing here.) This reefing line for the leech cringle starts on one side of the boom way aft, goes up and passes through the leech cringle, down to a turning block on the other side of the boom, and then forward to the mast. Once at the mast, it goes down through a turning block to another block attached to the halyard organizer plate, out to the deck organizer and back to a camcleat on the outboard corner of the port cabin top. Asymmetrical Spinnaker Tack Line. I only have this attached when using the spinnaker – it’s empty all the rest of the time. 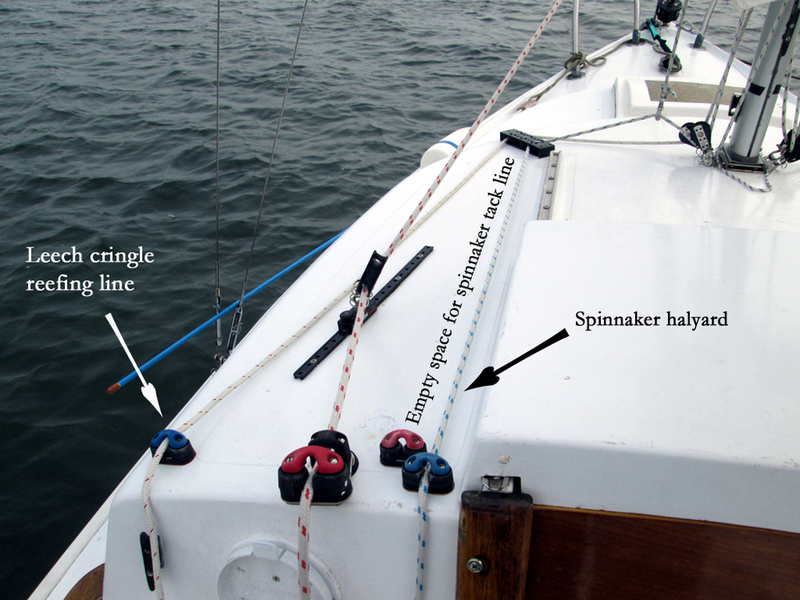 When the spinnaker is deployed, the tack line is attached to the tack of the spinnaker which goes through a block on the bow pulpit. It then travels back, goes through the middle sheave of the deck organizer and back to the middle camcleat on the port cabin top. Asymmetrical Spinnaker Halyard. I have a block attached about a foot down from the masthead for my spinnaker, and the halyard – tied to the base of the mast, ready to be attached to the spinnaker when wanted – goes up to the block, and then back down to another block attached to the organizer plate. It then goes out to the deck organizer and back to the camcleat closest to the companionway. 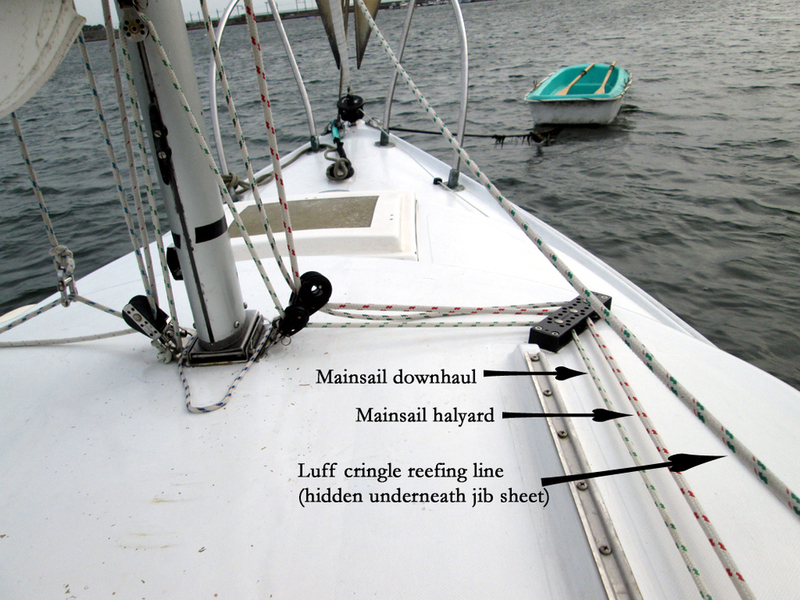 Mainsail downhaul. Being able to pull the gooseneck down to tighten the luff of the mainsail is great for small boats and eliminates the need for a cunningham. I have one end tied off to one of the holes on halyard organizer plate on the port side. It goes up, through a small block on the base of the gooseneck, and then back down to a block on the starboard side of the organizer plate. It then runs out to the deck organizer and back through the inboard rope clutch slot. Mainsail halyard. This line comes down through a block on the organizer plate, out through the middle sheave of the deck organizer, and back through the outboard rope clutch slot. Mainsail Reefing Line – Luff Cringle. This reefing line is tied off to an stainless eye riveted to the mast on the port side. It goes up, through the luff cringle in the sail, then down to a block on the organizer plate. It goes out to the deck organizer and through a camcleat on the outboard corner of the starboard cabin top. That’s about it! With all these lines, plus the jib furling line led back to the cockpit, I have a lot more control from the safety of the cockpit where the tiller is right there in case I need it.